Q&A Photo by Bob Mahoney ©2018 Warner Bros. Entertainment Inc.
Sarah Jeffery has a lot on her plate this fall. She's not only starring in the highly-buzzed about Charmed reboot but also stepping into the shoes of one of the most iconic female roles in television — Daphne Blake — aka one of the four members of Mystery Inc.
Daphne & Velma is the latest live-action movie installment in the iconic Scooby-Doo series, and it arrived on Hulu September 4 after originally being released on DVD, Blu-ray, and Digital HD on May 22 by Warner Home Video. Daphne's partner in crime is (of course) Velma Dinkley, played by Sarah Gilman, and the movie follows the two teens as they embark on a mission to solve something mysterious going down at their high school. 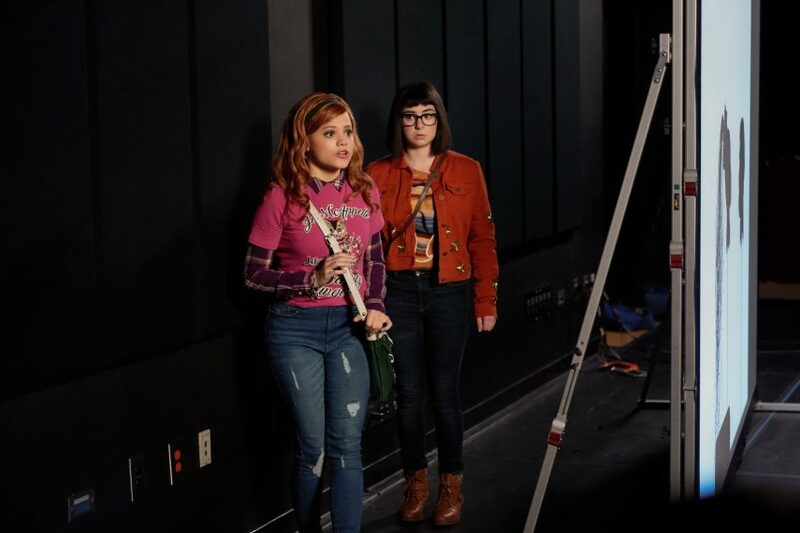 "Daphne has just transferred to Velma's school, Ridge Valley High, an incredible tech-savvy institute with all the latest gadgets provided by the school's benefactor, tech billionaire Tobias Bloom," a synopsis reveals. "And while competition is fierce among the students for a coveted internship at Bloom Innovative, Daphne and Velma dig beyond all the gadgets and tech to investigate what is causing some of the brightest students in school to disappear — only to emerge again in a zombie-fied state." Jeffery spoke with TV Insider about the role, promoting female friendship on screen, and why she's excited for fans to see Charmed re-imagined. What was your reaction to getting cast in this female-centric Scooby Doo live-action movie? Sarah Jeffery: I was so thrilled! Growing up I watched a lot of Scooby-Doo and loved Daphne. I named my first Build-A-Bear Daphne after her. So when I found out I would be portraying her it was super surreal and exciting. Read on, Marshmallows! We’re focusing on our wants and needs for the new episodes in the works. What kind of mystery do the teens solve? Daphne and Velma are looking into strange occurrences that start happening at their school — students start turning into mindless drones and they know something isn't right, so they start to investigate and eventually get to the bottom of it! Do you feel pressure to live up to fans' expectations with a big franchise like Scooby Doo? There’s definitely an element of nervousness seeing as we’re taking on such an iconic, beloved show, but I think we managed keep intact what made Scooby-Doo so special. The bright characters, the unexpected plot twists, the goofiness… there are a lot of nods to the original and special moments that I think original fans will appreciate. How does the movie depict strong, smart female friendships? This movie is so about women helping other women, and lifting each other up, which I think is so refreshing because we so often see women pitted against one another and that’s just not the right anthem to be singing. Daphne and Velma are two best friends who are different in many ways but both intelligent, strong-willed and caring. I think it’s especially important for girls to see a character like Daphne, who is quite a girly girl and loves fashion (typically those characters are portrayed as the ditz or the valley girl type character) be multi-faceted. This Daphne is colorful and I think she's a really great modern day depiction of the classic character that we know and love. The Charmed reboot is also about three young women coming together to protect the world: what message do you hope to send to the audience? Like I was saying about Daphne and Velma, I think it’s really special seeing young women supporting each other and showing up for each other in a loving and caring way. Charmed is great because it’s always been about the love story between the sisters, and I think that’s a powerful message. That reboot has faced some criticism online, how have you digested that? I think it’s just about accepting that everyone is going to have an opinion and choosing to focus on the positive and encouraging voices. As much as it'd be lovely for every single person to be rooting for us, that isn't ever really the case, which is totally okay. Although we do hope they give us a chance and tune in! Madeleine Mantock joins her 'sisters' Sarah Jeffery and Melonie Diaz. Which characteristics of Maggie do you identify with and which were more of a challenge? I feel really blessed in that I share a lot of similarities with Maggie. She’s outgoing and charismatic and friendly, but she's also insecure and empathetic and emotional. I would say the same thing I said about Daphne, it’s really lovely playing a multifaceted character that could've easily be played as the stereotype. I guess the challenge with playing Maggie is the technical stuff that comes with being a witch. There are a lot of moments where you have to interact with something that isn't necessarily there, because it’s FX’d in post. But it’s been cool and I’m very excited to see the end results. Can you tease a little about what happens in the upcoming Descendants 3 movie? There is very little I can say about my role in Descendants 3 without giving it away, but I will say that I think people will be pleasantly surprised with Audrey’s return. In addition to that, the scope of this film is pretty massive, it's visually beautiful, the music and dancing in it have leveled up yet again… and we have such a wonderful, talented cast, I think people will be really stoked when they see it.